Always ready for hi jinx and fun, members of the Detroit-based Slow Spokes cycling club pose for a group photo prior to Thursday’s first day of the Greene Trails Cycling Classic, at base camp on the county fair grounds in Xenia. Left to right: Bill Zakowsky; Ray Carpenter; John Wood; Fred Joyner; and Steve Skinner. 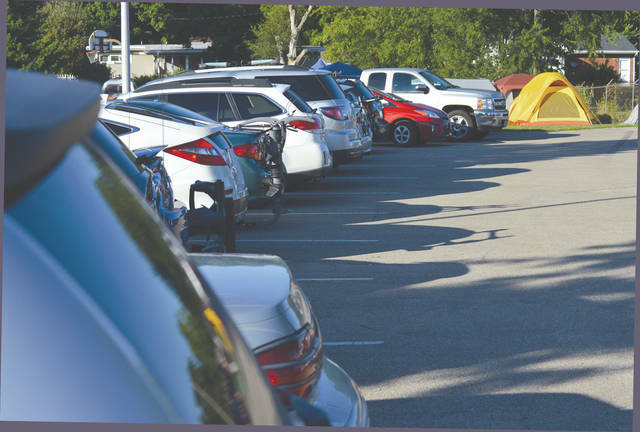 Nearly 100 small tents were seen on the Fairgrounds Resource Center grounds, in the early evening of July 18 on the night before the annual Greene Trails Cycling Classic, in Xenia. Before 8 p.m., the parking lot and grounds closest to the fairgrounds picnic shelter were nearly full July 18 as cycling enthusiasts from all over began setting up camp at the Greene County Fairgrounds in Xenia, in preparation for this week’s Greene Trails Cycling Classic which runs through July 22. 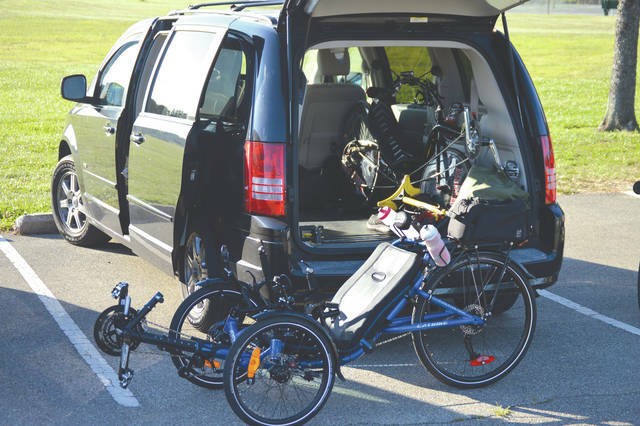 A cyclist’s SUV becomes a bicycle garage during the annual Greene Trails Cycling Classic on the Greene County Fairgrounds in Xenia. Nearly 350 cyclists have entered for the 15th running of the event. XENIA — They’re quick with a wisecrack, faster with a smile, and they always have a good laugh. A group of members from the Detroit-based Slow Spokes cycling club are in Xenia for the annual Greene Trails Cycling Classic, and on Wednesday night they were already having fun. 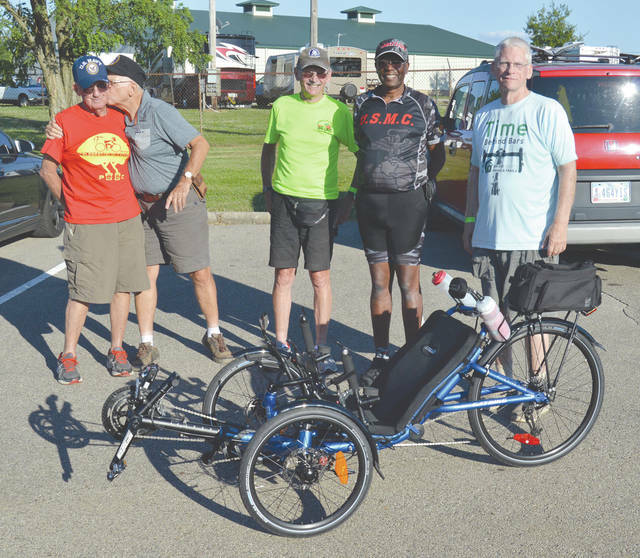 The annual four-day bicycling event has yet to officially get underway, but several members of the Slow Spokes had set off on a 100-mile ride on July 18, a day prior to the event’s first official ride. “These are the sweetest trails that I’ve ever found,” says Fred Joyner, 64, who was on his third Classic ride. “I’ve done a lot of road races, and I’ve ridden on a lot of trails all over the place, and these trails are the best maintained trails I’ve ever been on. The staff that maintains these trails? These guys should be eating steak every night. They do an amazing job. The Slow Spokes riders, who vary in age from 62 to 82, use recumbent bikes for their trail riding. Each rider averages between 2,500 and 3,000 miles of riding per year. Joyner showed the two trikes he brought for the Classic. One he has here in hopes of selling it. Another one remained tucked away in his SUV Wednesday night. His trail bike is capable of turning 40 mph speeds. “At our age, the recumbent bikes are easier for us to use. Plus, they’re just a lot of fun to ride,” explained John Wood, 75, also of Detroit. Wood was making his first Classic ride, but has prior experiences on the Xenia-area trails, and loves them. The gentlemen unintentionally paused as a pretty female rider slowly passed by. Their wives have another name for their cycling club. The group was concerned that Tano’s Bistro and Catering, a restaurant they frequented in Loveland, wouldn’t be open for this trip. Tano’s was destroyed in an electrical fire last year, but is expected to reopen in September of 2018. According to Gretchen Rives with the Greene County Parks & Trails organization, nearly 350 cyclists have entered for the 15th running of the Greene Trails Cycling Classic. By early Wednesday evening, close to 100 tents were seen on the Fairground Recreation Center grounds, just west of the county fairgrounds. Cyclists enjoyed a twilight trail ride from the fairgrounds to Jamestown and back on Wednesday night. Thursday’s ride will offer a 34-mile trip on the Creekside Trail west to Riverscape in downtown Dayton. Several side trips were offered for Thursday as well, including a trip to Young’s Jersey Dairy in Yellow Springs for an ice cream social. Friday will have two Century Ride options for the cyclists. A traditional 100-mile ride heads south to Miamiville from Xenia; and a metric equivalent 62-mile ride heads south as well into Morrow. Saturday offers a 50-mile ride, which takes the cyclists north to Yellow Springs and Springfield, with a 10-mile side jaunt to Clifton Mill also available. A Cycling Classic Poker Run will also take place, where entrants pick a playing card at three different stops along the route, then pick their final two cards back at the Xenia camp headquarters. The cyclist with the best hand of cards wins a nice prize later that night. Cyclists then have a final trail ride available on Sunday: a ride on the Ohio-to-Erie trail into Cedarville and further into South Charleston. One of the ROMEOs/Slow Pokes, Bill Zakowsky, was making his 14th run in the Cycling Classic. Zakowsky, 82, is the elder statesman of the Michiganders who were down for the ride. In recognition of his 14th Classic, friend and fellow cyclist Ray Carpenter planted a big kiss on Zakowsky’s cheek during a group photo. It’s all fun for these ROMEOs.